The big picture: (top, from left) K. Dinesh, Roy Eapen Jacob and Nilekani in Tampa, Florida; (left) Nilekani’s book, Imagining India, will release in November. Bangalore: It is high noon and Nandan Mohan Nilekani is doing something he rarely does: drumming his fingers. He is sitting in a conference room adjacent to his office with six Infosys Technologies Ltd employees. Their goal, which also happens to be Nilekani’s pet project, is to make the computer services giant an environmentally sustainable company. “How far is Infosys from being carbon neutral? Why are the rooms kept so cold? In Bangalore, we shouldn’t even be using air conditioners, yaar,” says Nilekani as he listens to presentations and fires questions and suggestions. He listens to an Internet-led carpooling scheme. “But, people should hook up through SMS. Who wants to go online to check if a car is going to Electronic City?” he says. What about energy consumption? A young man launches into explanations. Infosys wants to convert all personal computers into more energy efficient laptops but vendors aren’t keen as the orders aren’t large enough. Perhaps, if Infosys can team up with rival Wipro Ltd and other local IT firms and then order such laptops, vendors might fall in line. “I’ll talk to Azim (Wipro chairman Premji) about it,” Nilekani promises. Nilekani instructs the group to make sure every new building that goes up on an Infosys campus complies with sustainability guidelines. “Just tell all our architects and builders that if they want our business, they build to our specs,” he says. Then comes a mind-numbing array of numbers: litres of water flowing through urinals, the number of lights left on at night on campus, how many cars on campus, air-conditioner temperatures, wattage of electricity used. For someone who could very easily build a coterie of sycophants around him, Nilekani seems to do the exact opposite. “He is not vain; cares little for external appearances; is easily bored with others’ vanities,” says his wife Rohini Nilekani. It isn’t to say Nilekani doesn’t hang out with the usual suspects — CEOs of multinationals, entrepreneurs on the verge of going public, and multimillionaires. But he also reaches out to solar-panel specialists and climate change researchers; social activists and historians; educators and architects, and even the occasional herpetologist. Some of this is clearly because of Rohini, a writer and philanthropist though, in many instances, he reaches out on his own. “I am curious about people who march to a different drummer,” says Nilekani. Unlike the typical CEO, Nilekani seems to actually act on his curiosity. He asks questions; he is interested. During one car-ride, we compare Bangalore to other cities. Delhi, we agree, is all about power, in a which-politician-attended-your-son’s-wedding sort of way. Mumbai is about wealth — isn’t-my-yacht-bigger-than-yours. “Bangalore is about ideas and that suits me,” says Nilekani. My own reason for liking Bangalore is not so macro, I say. I like Bangalore because people actually make an attempt to start book clubs in spite of the numbing traffic. Nilekani nods. For years, Rohini and he were part of a quiz club with many families. Then come the questions. What book were we reading? Who was in the book club? Turns out he knows most of the people in my book club. This is how the man does it, I think. Next time he meets someone from my book club — whose names he will remember — Nilekani will most likely casually ask: “So, how was your book club discussion of The Hungry Tide?” And they will be flabbergasted. In June 2007, after five largely successful years as CEO of Infosys, Nilekani decided to step down. It was, he says, time to pass the baton. But it was yet another turning point in the remarkable journey of a young man from Sirsi who walked into an office at Patni Computers some 27 years ago to ask for a job from one N.R. Narayana Murthy, the now legendary chief mentor of Infosys. These days, Nilekani is co-chairman of Infosys. He plays ambassador, helps with brand building and key clients. He is still vitally involved, but the company’s day-to-day affairs don’t preoccupy him any more. A few passions occupy Nilekani these days. The first still has to do with helping Infosys. The second is what he calls “paying off old debts and giving back”. Be it giving IIT Bombay $5 million (around Rs21 crore, now) for a chaired professorship, an incubator, the school of IT, a new hostel and renovating old ones; building a new auditorium and endowing his old school in Dharwad, where he grew up; contributing to a hospital wing in Sirsi, his ancestral home town. Nilekani speaks with quiet authority yet the tone is conversational, neither preachy nor self-aggrandizing. He offers to sit with them in six months to review progress, saying he will fly out to Pune and reduce the carbon footprint rather than have the six of them fly to Bangalore. He also offers to visit their factory the next time he is in Sirsi. “The family is known to me and the patriarch miraculously found a house for us in Bombay (Mumbai) when Rohini and I were newlyweds. I can never forget that,” he says. Again, repaying old debts. Then there is Nilekani’s reform agenda, including, for now, e-governance, urban issues, and climate change. He has given nearly $4 million to set up the E-governments Foundation (http://www.egovernments.org) that aims to use technology to help municipal governments. It is run by former Intel Corp. executive Srikanth Nadhamuni, a passionate advocate for e-governance, whose wife, Sunita, happens to head Rohini’s foundation. Joker is a word Nilekani, 53, uses often, and to great effect. Bozo and yaar (friend in Hindi) are others. This does several things: It disarms people and makes Nilekani appear more approachable than he is. It also allows him to interrupt rambling presentations without seeming rude. Indeed, within Infosys, Nilekani is famous for cutting off speeches. “You walk in with a half-hour presentation and 3 minutes later, he’s like, ‘Okay, I get it. Now what?’,” says Sanjay Purohit, head of Infosys’ corporate planning division. Over the years, thanks to numerous 360-degree evaluations, Nilekani has also tried to temper his impatience. “For someone with such a quick mind, he is a superb listener,” says his friend, designer Sujata Keshavan. One afternoon, Nilekani spends 4 hours at the offices of Janaagraha, an urban reforms group co-founded by (Mint columnist) Ramesh Ramanathan. He listens to a long presentation from a distinguished lawyer and academic about what is wrong with the Indian judicial system. In the end, the men brainstorm ways of fixing it: At one point during the lawyer’s oration, Nilekani interrupts him with a, “Boss, Boss…let’s look at it this way.” It is classic Nilekani. Disarm, then deliver ideas. A few days later, Nilekani hammers home the same solutions at a conference held at the Karnataka high court to a room full of lawyers and judges. Nilekani calls it the “multiplier” effect. He says that he gets involved in issues where he can have a “seminal impact” on the way things are done. It’s a high return on investment, he says. So he chooses areas that are in the cusp of change; where lending his voice will give momentum and speed; issues with far-reaching impact; like legal reform. It’s true. Perhaps because of his irreverence; perhaps because he seems approachable; perhaps because of his self-deprecating humour; or perhaps because Nilekani doesn’t take himself so seriously, all kinds of people hit him with all kinds of requests. Mostly, he says no. But, he does it gently, without shattering smaller egos. Some of Nilekani’s motivation for social change comes from the bar-belled circumstances in which he grew up. Born in Bangalore, Nandan is a Chitrapur Saraswat Brahmin — like Girish Karnad, Shyam Benegal — and speaks Konkani at home. His father, Mohan Rao Nilekani was a manager at Minerva Mills, with several transfers and job changes that took him from Bangalore to Davanagere to Nirmal in Andhra Pradesh before he retired to Dharwad. As a result, both siblings bounced around as children. Vijay was eight years older and so the brothers didn’t have much contact while growing up. Young Nandan stayed with his uncle in Dharwad after he turned 12 — an early enforced independence that might have been tough on a kid. “I think all the early variation contributed a lot to our world view and values,” says Vijay. Their father was a passionate individual with Fabian socialist views and altruistic instincts. He would write endless letters to the editor and to the prime minister; sue corrupt bureaucrats and politicians; take on strays, orphans and poor relatives into their ancestral Sirsi home. His tenacity, says Vijay, “was a touching and seminal experience for all of us”, something which they still recall seven years after their father’s passing. Their mother, Durga, who is 83 and lives with the Nilekanis in Bangalore, was the “anchor” who tolerated their father’s “frailties and idiosyncrasies”. 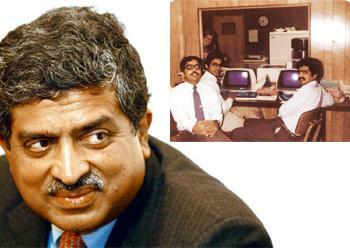 A high achiever right from childhood, Nilekani fast-tracked into IIT Bombay right after Dharwad. He speaks of his experiences at IIT fondly, recalling how “this raw small-town kid” became exposed to a larger world; and met his future wife. The two brothers are clearly a lot closer now. The families vacation together: in South Africa, Goa, Kerala, on ski trips and sailing holidays. Not enough, though. “Whenever I meet Nandan, I say that it is like sighting an endangered species; like the rare sighting of a Bengal tiger,” Vijay says, with a chuckle. Nilekani works out of a spacious corner office in the corporate block of Infosys, surrounded by the leafy tops of trees with pink tabebuia flowers. His desk is spare. Shelves hold multiple awards and photographs of him with various powerful people: Nilekani with Tony Blair; shaking hands with Bill Clinton; with a large India contingent in Davos; with Manmohan and Mrs Singh in the White House with Laura Bush. On his desk is a small black-and-white photograph of Rohini and him. What Nilekani hears, he digests instantly and has complete playback from then on, thanks to a prodigious and impeccable memory. “I wish I could have Nandan’s memory but that is impossible,” says Infosys co-founder S.D. Shibulal, who roomed with Nilekani in the early days. Do they confide personal problems in each other or do they go to great lengths to hide vulnerabilities, I ask. “After 26 years, what vulnerability can I hide from Nandan?” Shibulal shoots back. What I really want to know is how the founders deal with it if one of them screws up in a major way. So, I ask Murthy. They start every transaction with a zero-base, Murthy replies. They deal with data in a logical way and keep egos out of it. “And, we smile when we walk out of the room,” he says. This may explain why the average Infosys employee perceives Nilekani more as a global ambassador for the Infosys brand than the leader they can relate to. “Nandan is an introvert masquerading as an extrovert,” says Infosys HR’s Gurjar. Still, it is clear those at Infosys don’t like to talk about how Nilekani became the first among equals, after Murthy. Perhaps it was because Nilekani’s smooth marketing skills were needed at that phase of Infosys. Perhaps it was a simple case of meritocracy — Nilekani, at that time, was just better than the other co-founders. “The rest of them wanted to be told what to do whereas with Nandan it was always, ‘This is what I want to do and Murthy, is it okay with you?’” says one senior Infosys executive who didn’t want to be identified. What has taken up a lot of Nilekani’s bandwidth these days is his book, a grand vision statement. Called Imagining India, the book outlines Nilekani’s ideas for India — past, present and future. Guha calls Nilekani a “passionate democrat who aligns himself with the broad tradition of humanistic and democratic politics in modern India. I’ve rarely met an Indian who has such a sure and quick grasp of social and political issues. Some other tycoon would have written a much more superficial and simple-minded book”. Why bother, I ask Nilekani. What do you have left to prove? Are you playing at being author? Call him a bozo and he’ll say it right back at you; call him cold and unemotional, as some Infosys employees do, and Nilekani will listen — unemotionally, of course. But, imply that he is faking it and the man will get royally pissed off. Nilekani is not a screamer. At work, he rarely raises his voice, unlike Murthy, who, some employees say, “rants and raves”. But Murthy also takes ownership of problems in a way that Nilekani doesn’t. “I am not confrontational,” Nilekani allows. Neither is he a control freak. Several employees at Infosys talk about how Nilekani allows them to take an idea and run with it. When Nilekani took over as CEO, Infosys was in a bit of a crisis as the US market had collapsed after the technology bubble burst in 2001. Indeed, asked what the absolute low point of his life was, Nilekani says it was the year after he took over as CEO. The absolute high point? 2006, when “all my contributions to the company seemed to come together and pay off.” That was the year he won the Padma Bhushan, was elected to the World Economic Forum Foundation board, named by Time magazine as one of the 100 most influential people in the world. Nandan is all bonhomie and charm, suave and polished, Western in speech and demeanour. He cracks jokes, charms the guy, saying, “You’ve always been ahead of the curve.” He spouts the party line and liberally ad libs. He tells the analyst that several divisions in Infosys work together to come up with a comprehensive product. This is rich because just in the previous meeting, Nilekani was exhorting the New Business Models group that they ought to talk to each other more often; that they shouldn’t work in “silos”. Nilekani actually seems — is indeed interested — in the visiting analyst’s ideas. “So, what’s your prediction for the US?” he asks and then listens intently. When the analyst mentions a presentation that he has put together on the subject, Nilekani says, “Why don’t we go next door and view it?” The analyst leaves, bedazzled. Rohini and Nandan live in an airy sprawling home in Koramangala. There are two parts to the house: the entertaining section of the house that is impersonal, designed to impress. The living wing reflects their personality more. It is spare, bright with skylights, and uncluttered. It feels airy, lived in. 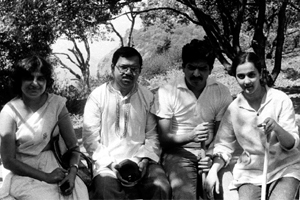 Wearing a blue kurta and pants, Nilekani is relaxed as he potters around barefoot, eating dal-roti-sabzi and salad for lunch; seeing off his son, Nihar, who is going to write an exam and whispering to his mother, who shuffles in and out. In one corner are some hanging bells; in another, a tulsi-katte, a square structure with a holy basil plant on it. There are fresh flowers everywhere. For such a large house, it manages to keep the intimate scale of a home. Relative to their means, the Nilekanis lead a pretty simple life. They seldom show up in the gossip pages of magazines and newspapers. They splurge on travel but little else. “I am not Gandhian, but my kids (daughter Jahnavi, now in Yale, and son Nihar) keep me grounded,” says Nilekani, who also readily admits to being a “pretty poor parent especially in the early years when I simply wasn’t around”. Nilekani lives by certain rules. He sets goalposts for himself — three or four things that he pursues relentlessly. He wants to be “stingy with his time but generous with his money”, to be productive without being busy. Not a great believer in the BlackBerry, he thinks the whole back-and-forth emailing is a waste of time. He likes to pick up the phone and resolve issues. Nilekani’s network of influence is indeed huge and he does like to socialize, exchange ideas. The Nilekanis entertain visiting dignitaries often on the lawns of their home. But Rohini and Nandan also have very independent public personas. She is the anchor of Uncommon Ground, a TV show on NDTV, the chairperson of the Akshara Foundation, which deals with early-childhood education; and Pratham Books, which aims to publish quality books at reasonable prices. More recently, she pledged $25 million of her money — it came from her own investments into Infosys some 26 years ago — to start Arghyam, with a goal of bringing safe sustainable water to all. “Rohini has a very strong social conscience,” says Nilekani, adding that her influence on him has been “huge in a number of ways. She has made me see things that I otherwise would not have noticed. She has made me far more human”. When he is in Bangalore, Nilekani is up every morning at 5.30 and then exercises for an hour with a trainer. By 7am, he has accomplished a great deal. He checks his email once in the morning and once in the evening, and if he finds time, during the day. Every now and then, Nilekani will sit down with a piece of paper and write down things he needs to change about himself. “I don’t want to call it reinventing myself but I do want to stay relevant,” he says. Staying relevant could mean studying every research report about climate change he can lay his hands on; talking shop with retailer clients and technology with telecom clients. Mostly, it is an uncommon skill he has developed of wading into any area and quickly, as he says, “distilling it into its key issues — challenges, constraints, assets, and advantages — and framing solutions”. A voracious reader, Nilekani rues the fact that he mostly reads research reports these days. He gravitates towards non-fiction and thinks fiction is “a waste of time; plus the great fiction books were all written in the old days and I’ve read them anyway”. When asked what he does to relax, he says, “I vegetate, yaar.” A sharp contrast to older brother Vijay, a licensed pilot; scuba-diver; ocean-going sailor and yacht owner; downhill skier; and as of his 60th birthday, a bungee jumper. Nilekani says he has little interest in things that consume most Indians: Bollywood, cricket and the minutiae of politics. “Once you remove those three things, a great deal of time and mental space is freed up,” he says. Yet, Nilekani is clearly not a Renaissance man who can wax eloquent about Picasso, Pushkin or Purandara Dasa. He seems to have little interest in the arts, poetry, music and philosophy. He is an ideas person but, only those that can be applied. A man who lives in the present and the future. Nor does he endlessly dissect or regret the past.